Pongamia Pinnata trees are normally planted along the highways, roads and canals to stop soil erosion. Billions of trees exist all over India. If the seeds fallen along road side are collected, and oil is extracted at village level expellers, thousands of tons of oil will be available for Lighting the Lamps in rural area. It is the best oil for lighting. Since these are spread over a large area, collection of seeds for BioDiesel manufacture is not viable. (A compact plantation can support a BioDiesel plant). Pongamia Pinnata is called as Koroch in Bangladesh. There, it is a fresh water flooded plant / tree. The seedlings of Koroch can survive in 1.5 meters deep water submergence / inundation for five to six months duration at a stretch. There are nearly 30,000 square km of water reservoirs in India. This tree can be cultivated in such water storage reservoirs up to 1.5 meters depth and reap additional economic value from unused reservoir lands. 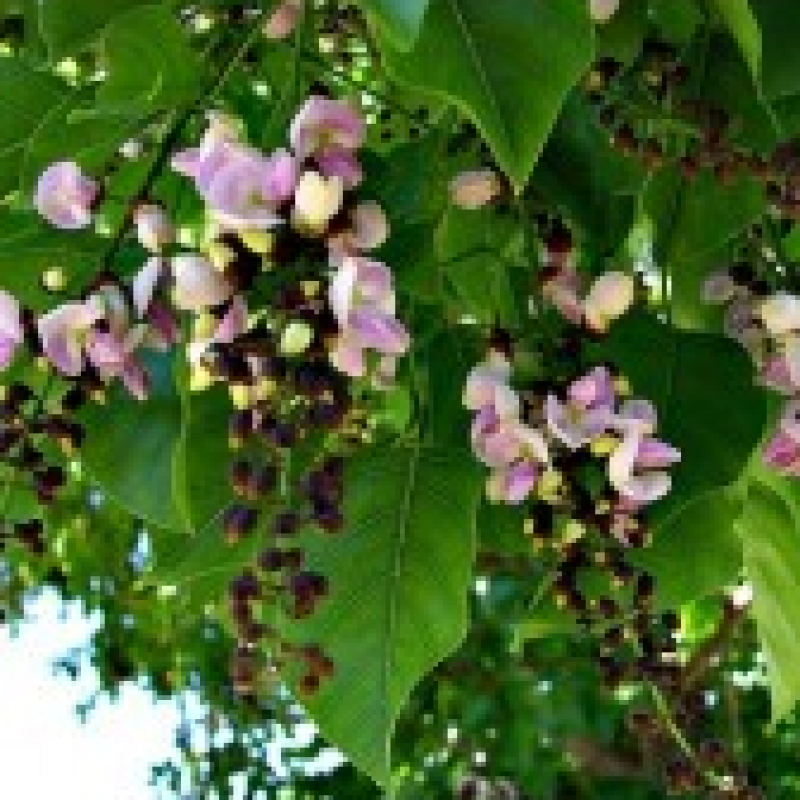 Pongamia Pinnata is one of the few nitrogen fixing trees to produce seeds containing 30 to 32% oil. It is often planted as an ornamental and shade tree. This specie is commonly called Pongam, Karanj, or a derivation of these names. Botany: Pongamia (Leguminoceae, subfamily Papilionoideae) is a medium sized tree that generally attains a height of about 8 meters and a trunk diameter of more than 50 cm. The trunk is generally short with thick branches spreading into a dense hemispherical crown of dark green leaves. The bark is thin gray to grayish-brown, and yellow on the inside. The tap root is thick and long, lateral roots are numerous and well developed. The alternate, compound pinnate leaves consist of 5 or 7 leaflets which are arranged in 2 or 3 pairs, and a single terminal leaflet. Leaflets are 5 to 10 cm long, 4 to 6 cm wide, and pointed at the tip. Flowers, borne on racemes, are pink, light purple, or white. Pods are elliptical, 3 to 6 cm long and 2 to 3 cm wide, thick walled, and usually contain a single seed. Seeds are 10 to 20 cm long, oblong, and light brown in color. Widely occurs and commonly planted species because of its wide adaptability. It grows best in fairly moist situations on porous and well drained soil; thriving even on pure sand and black cotton soil. Pongamia Pinnata grows almost anywhere, even on gravelly, sandy and saline soils. It can thrive on the poorest stony soil. It can grow even in the crevices of rocks.